Both customers and merchants can cancel a subscription. Contacts the payment gateway used by the Store and cancels the recurring billing profile there. At the time the subscription is canceled, both the merchants and customers can specify the reason for the cancellation. Merchants can enter both a “public” reason (which is mentioned on the e-mail sent to the customer and in the subscription summary page) and internal comments (not shown to the customer). On the page where you can enter the reason for the cancellation (shown above), there is a checkbox that you can check to indicate that the subscription has already been canceled through the payment gateway. 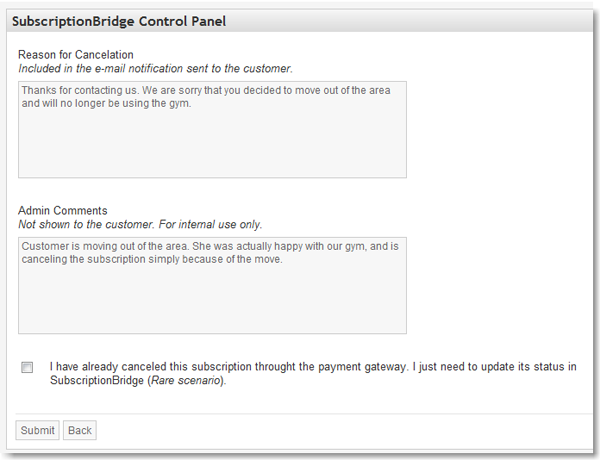 If you check that checkbox, when SubscriptionBridge contacts the payment gateway it will ignore any errors returned by the payment gateway (errors due to the fact that the subscription had already been canceled and cannot be canceled again), and simply update the subscription status in SubscriptionBrdige.